The PhotoFun app enables participants to create their own personalized images for the contest by using the image editor, which will allow them to personalize their photos with frames and stickers. With the Premium plan, you can choose the frames and stickers you want from the Easypromos library. With the White Label plan, you can upload your own frames and stickers, so that participants use your logo, branding or theme. To take part in the contest, users have to sign up at the link shared by the organizer. Step 3. Set up the "PhotoFun"
We explain you now all the steps to set up your PhotoFun. 1. Go to your promotion management page, and click through to the Editor. 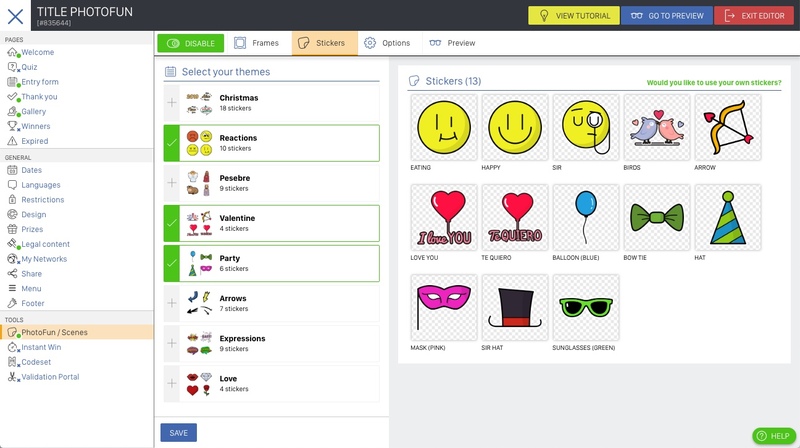 In the first tab, you'll see all the stickers in the Easypromos library. Click on the different themes to see the full range of stickers. Choose which stickers will be available to users. In the second tab, you'll find the frames, which are also grouped by theme. Click to see which frames are available for each theme. Choose which ones to use in your contest. Reorder frames: you can decide in what order you want to present the frames to users. Modify the name of the frames: if you decide to show the name of the frames, you can modify the name because by default the name of the file is used. 1. Proportion: It shows the proportion of the image according to the format of the PhotoFun, which by default is configured with the Square format (800x800), but you can edit it here as necessary. 2. Button label: Edit the text of the button which users see. 3. Display photo, sticker and frame names? Decide whether users will see a title for each frame and sticker. 4. Is the frame mandatory? Require participants to use a frame for their photo. 5. Load automatically when user goes to Entry Form. This option allows to open the PhotoFun tool automatically when you click on the "Participate" button of the promotion, even before the user completes the fields of the entry form. 6. Min./max. number of stickers: Define how many stickers participants can use. 1. Go to Editor > Tools > PhotoFun and click on the Stickers tab. Top tip! We recommend uploading transparent .png images with a white border. This sticker format is optimized to integrate with images. 3. In the Frames tab, you can also add your own frames. Click on the green Upload your own frames text. Once you have enabled and configured the PhotoFun, the next step will be to finish the configuration of the contest and the personalization of the different screens of the promotion. To do this, you can follow the Photo Contest tutorial from Step 2.